In the rent-to-own program, LBWN and Impact Seven invested an average of $125,000 per home in renovation costs, restoring abandoned, foreclosed homes to livable condition. Image courtesy of Impact Seven. A partnership between a community development financial institution and a community development corporation is meeting two needs in Milwaukee, Wisconsin. The partnership is both revitalizing neighborhoods with foreclosed properties and providing affordable housing for low-income families. In June 2009, the city recorded 1,619 bank-owned and 138 city-owned foreclosures and more than 4,000 open foreclosure filings. Milwaukee was facing conditions commonly found in areas with high foreclosure rates: depressed property values, high crime rates, and increased municipal service. 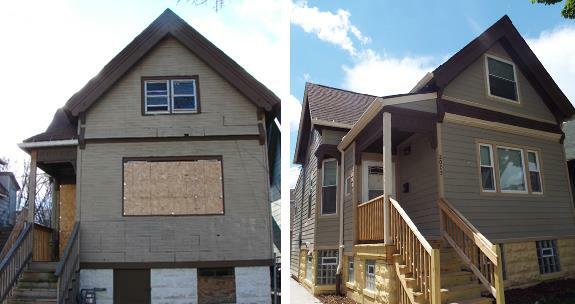 Through a collaborative rent-to-own program, Impact Seven and Layton Boulevard West Neighbors (LBWN) have rehabilitated vacant residences in the Silver City, Burnham Park, and Layton Boulevard neighborhoods. The program allows low-income residents to pay an affordable rent for 15 years and receive a credit toward a downpayment if they choose to buy the house after that time. LBWN has renovated foreclosed properties through its Turnkey Renovation program and constructed townhouses for a rent-to-own program. 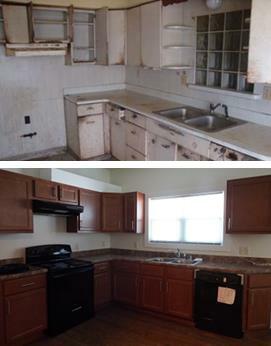 Impact Seven has helped finance, develop, and manage properties in distressed communities throughout the state. In 2011, the two nonprofits combined their skillsets in the rent-to-own program for foreclosed properties in the Near South Side of Milwaukee. Within a year, the partners had identified and purchased 21 single-family houses, a duplex with 2 residential units, and a live/work building. The renovations, which were completed in summer 2014, included replacing roofs, windows, siding, and hot water heaters, as well as plumbing, electrical, and HVAC systems, according to Todd Hutchison, consulting director of real estate development at Impact Seven. Renovation costs for each residential unit in the rent-to-own program averaged more than $125,000. The renovated homes feature ENERGY STAR® appliances and meet Wisconsin Environmental Initiative’s Green Built Homes standards for remodeling. Tenants for the renovated units were selected based on income in accordance with Low-Income Housing Tax Credit (LIHTC) program guidelines. Of the program’s 24 residential units, 17 are set aside for households earning no more than 50 percent of the area median income (AMI), and 7 are reserved for households earning up to 60 percent of AMI. Tenants were also screened to ensure that they did not have a criminal record, had not been evicted, and had not recently declared bankruptcy. Impact Seven will manage the rental units for 15 years. At the end of the rental period, each tenant who decides to purchase the home will receive a credit of approximately $36,000 to be used for the downpayment. To prepare tenants to own a home, the partnership will sponsor annual homebuying classes provided by local banks and other local service providers. Kitchens in the renovated homes feature efficient ENERGY STAR appliances. Image courtesy of Impact Seven. To further enhance the neighborhood, the partnership also purchased a vacant 3,000-square-foot commercial building adjacent to the rent-to-own program’s live/work building along National Avenue, a commercial corridor in the Silver City neighborhood. Renovations to the building replaced the front windows and restored the tin ceiling and skylight, revitalizing the storefront for a new local business. To identify a suitable tenant for the commercial space, the partnership held a business plan competition. In addition to a lease for the property, the winner received $5,000 from a local foundation for startup costs, as well as free professional services and 3 months’ rent to help the business get underway. The $6.3 million rent-to-own program relied on funding from various sources. The project received $4.8 million in equity from the sale of LIHTCs provided by the Wisconsin Housing and Economic Development Authority. Town Bank provided a $275,000 loan and administered a $192,000 forgivable loan from the Federal Home Loan Bank of Chicago. The city also contributed funds from HOME Investment Partnerships ($158,000) and the Neighborhood Stabilization Program ($660,000). Impact Seven and LBWN covered the balance of the program costs. Layton Boulevard West Neighbors. n.d. “About Us.” Accessed 29 August 2014; City of Milwaukee. 2009. “April 1, 2009 thru June 30, 2009 Performance Report.” Accessed 3 October 2014. Impact Seven. n.d. “LBWN Rent-to-Own Homes.” Accessed September 1, 2014; Interview with Todd Hutchison, consulting director of real estate development at Impact Seven, 5 September 2014. Interview with Todd Hutchison, consulting director of real estate development at Impact Seven, 5 September 2014; Email correspondence with Todd Hutchison, 23 September 2014. Impact Seven. n.d. “LBWN Rent-to-Own Homes.” Accessed September 1, 2014; Interview with Todd Hutchison, 5 September 2014; Email correspondence with Todd Hutchison, 23 September 2014; Email correspondence with Todd Hutchison, 25 September 2014. Interview with Todd Hutchison, 5 September 2014; Email correspondence with Todd Hutchison, 23 September 2014. Email correspondence with Todd Hutchison, 25 September 2014. Interview with Todd Hutchison, 5 September 2014; Email correspondence with Todd Hutchison, 25 September 2014. Email correspondence with Todd Hutchison, 23 September 2014; Email correspondence with Todd Hutchison, 25 September 2014.